Powered by the new Shimano E8000 engine, the Merida eONE-SIXTY 900E delivers extraordinary performance. Light and responsive, the E8000 marks a new era for eMTBs. Merida refer to their frames as having a ‘casting motorbracket’. This allows a more integrated look as well as improved motor performance. In addition, frame material is triple butted aluminium alloy and is extremely light and durable. Manufacturing ensures an optimised stiffness-to-weight ratio. A huge 500Wh battery ensures long rides, and fits seamlessly into the frame. Gearing on the Merida eONE-SIXTY 900E doesn’t get any better. A Shimano XT Shadow Plus and 11-speed 11-46T cassette work in perfect harmony. Add Di2 electronic easy switch shifting, and the result is effortless, reliable and efficient gear changes. Wheels are tough, stable and reliable. Maxxis Minion DHR II 2.8″ Plus tyres adorn the awesome, lightweight DT Swiss HX1501 Spline One rims. Consequently, the result is ultra strength and endurance. Hubs are once more DT Swiss and utilise the fabulous HX1501 Spline One 35 boost. A perfect match. Braking comes in the form of Shimano Saint hydraulic disc brakes. A set of 203mm rotors are more than up to the job. Shimano Saint brake levers add a nice feel,to what is a very responsive and effective system. Furthermore, the aesthetics of the eONE-SIXTY 900E are enviable. Internal cable routing has been perfected thanks to Merida’s ‘Smart Entry’ approach. Cables are routed internally. However, they are clamped under tension eliminating cable rattle and noise even when the going gets tough. Special inlets and outlets ensure a clean and uncluttered look. For even greater strength and resilience, welding comprises a two-stage process. A second weld evens the connecting welding seam. This produces a ‘smooth-weld’ appearance for even more astonishing looks. 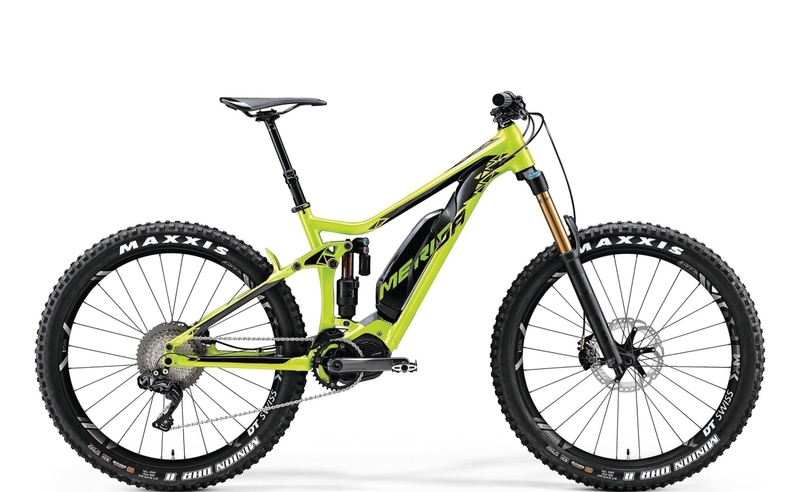 Merida really have thought hard about producing a top end eMTB. The eONE-SIXTY 900E is a real winner. Also available in absolutely stunning black, is the Merida eONE-SIXTY 900E Black.